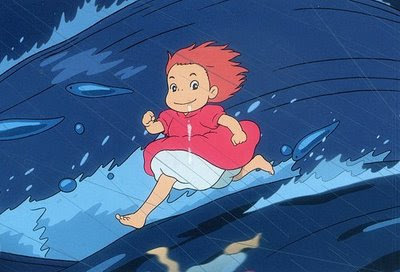 The first few seconds of Studio Ghibli’s Ponyo on The Cliff By The Sea immediately took me back to my all time favourite Disney Classic: The Little Mermaid. Do these two really have that many similarities or is it just my imagination? The two movies offer on huge similarity, since they both involve sea life and mermaids in particularly. From this initial superficial comparison the list will continue to grow. In both the mermaids (Ponyo and Ariel) have a desire to become human because they like a boy. Their dads try to stop them from achieving this goal, yet eventually give into the will off their loved ones. In Disney this means that Triton makes Ariel human, while in Ponyo Sosuke has to prove his love to Ponyo and kiss her to make her human. The parents of both Ponyo and Ariel are gods. Although it’s Ponyo’s Mom that is the goddess, not her dad, Fujimoto. And in the Little Mermaid Ariel’s Mom is absent entirely. So there are some differences here. However the list continues: both stories contain an evil magician. In Ponyo it’s Fujimoto, while for Ariel it’s the evil witch Ursula. These two characters also form the ‘evil’ within both movies. The theme of rebellion is also carried by both movies. Ariel and Ponyo rebel against their parents. They want to find their own way and chose their own path in life, even though their parents might not approve of their decisions and they are willing to risk it all. At first many of the similarities between the stories didn’t become clear to me, yet I was immediately reminded of Disney’s Little Mermaid, because of the art in Ponyo. The forms of the underwater buildings resembles those in the Disney movie. The colours and liveliness of the underwater world and the frequent use of bubbles also counts as a similarity between the two. Yet the most obvious and the most beautiful similarity is of course the hair of the mermaids, as you can see in the pictures below. I cannot help but feel that one of Ponyo’s inspirational sources was Disney’s the Little Mermaid. I can see the differences in story and appreciate them independently, yet I cannot ignore their similarities and I view them as contributors to the beautiful fairy tales about mermaids. I doubt Miyazaki was influenced by Disney’s “Little Mermaid”. Miyazaki has a penchant for red-headed heroines, after all. If anything, the “Little Mermaid” was influenced by Miyazaki’s 80s works, with which many Disney animators were familiar and greatly treasured. The narrative similarities between the two adaptations are not that significant, and come mostly from the original “Hans Christian Andersen” fairy tale. Oh yes! I agree with you fully there s’phard! I never intended to accuse Ghibli of stealing the idea from Disney, I’m merely a fan of both Disney and Ghibli and LOVE the similarities in these two movies (though they are superficial). It’s so much fun that two movies an be this inspirational and create extra dimensions for this lovely fairy tale! I just saw the trailer and read the outline of the story and thought the same thing about the similarities with The Little Mermaid. I’m glad I wasn’t the only one who noticed. Whether or not Miyazaki was inspired of the Disney retelling, the original Hans Christian Andersen tale, both, or neither, it still is an interesting story told in truest Miyazaki fashion. I can’t wait to see it. wow…dont even GO there with the little mermaid crap…Miyazki is an original kinda guy. I DON’T SEE HOW PONYO AND L.M. COULD EVEN BE LIKE EACH OTHER….MAYBE ITS JUST ME….TRY Fusion Fall…on cartoon network!…Just dont curse or be perverted on that game…TRUST ME. YOU WILL GET BLOCKED!!!!! Like The Little Mermaid, Ponyo is based on Hans Christian Andersen’s story (though even more loosely than the Disney movie is). That’s the source of the similarities–though neither one goes for Andersen’s sad ending. I was actually wondering whether the character of Fujimoto in Ponyo is meant to look something like Andersen. Yeah, that’s where the similarities mostly come from, nw2, and maybe you’re right about Fujimoto! Never thought of that. And Fusion, the similarities don’t make Ponyo any less original or awesome!! Actually it is supposed to be an adapted version of the little mermaid. Wow. It’s funny to see all these anime disciples zealously defending Miyazake, one of their principal deities. Get a grip, folks. The two stories ARE very similar. In fact, I only happened upon this page because I googled to find out whether Ponyo was a retelling of TLM, since nowhere was anybody acknowledging its likeness to it. I’ll bet if TLM came out AFTER Ponyo, you’d see all these same people riotously accusing Disney of ripping off Miyazake. I am also a great admirer of Miyazake (Porco Rosso is my favorite) and find his work very original. However, that doesn’t mean he can’t draw inspiration elsewhere, whether consciously or unconsciously. Oops. I typed this in Word to let it spell check me and then pasted here…didn’t realize that for some reason it was changing Miyazaki to Miyazake. So for all those about to attack me for that, YES, I do know how to spell his name! You know, I don’t think he was influenced by The Little Mermaid. I think yes, he was influenced by the Hans Christian Anderson tale, but not necessarily the Disney movie. I say that because of the elements that you say are similar in Ponyo they are either a) influenced by the original fairy tale or b) typical Miyazaki storytelling. For example, he went for the rebellious heroine and happy-ending boy-girl story because that’s his style; in most of the works I’ve seen by him, he clearly favors the ending that allows for the two main characters to end up together. Wizards and powerful magic aren’t exactly uncommon in his stuff, either. As for the similarity in underwater scenery, etc… I don’t know what to tell you. I guess, yeah, both were inspired by the same source, so they’re bound to have visual similarities, but I personally was not reminded of The Little Mermaid in that way; to me Ponyo was more like… watching a living watercolor painting. The disney movie never seemed that colorful and… alive to me. But I suppose that’s an opinion. And who knows, maybe Miyazaki DID take influence from Disney. (Personally I’d like to think that Ponyo’s hair color came from the fact that she was originally considered a goldfish). Geesh, guys calm down! It is not a bad thing. Since both Pony and TLM are based on Hans Christian Anderson’s tale, I am not annoyed by thier similarities and neither should of any of you. I think it is awesome that they are similar in some ways.